Fast & efficient stump removal service for all of Courtice. This year get your property in great shape by removing all those unsightly and dangerous stumps. Create the lawn you’ve always wanted where your kids and pets can play safely. StumpTech is the Courtice leader in stump removal. 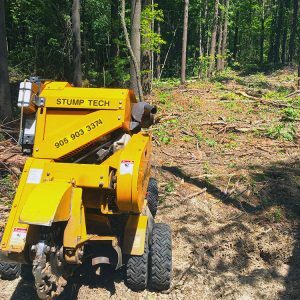 Our well-trained technicians have years of experience removing stumps and they have the best equipment to make sure they can remove any stump. It doesn’t matter how big or small your property is. Fenced in properties are not a problem for our technicians as long as there is an opening at least 36” wide so that they can get a stump grinder through the opening. Call us today to get a customized estimate for stump removal anywhere in the Courtice region. 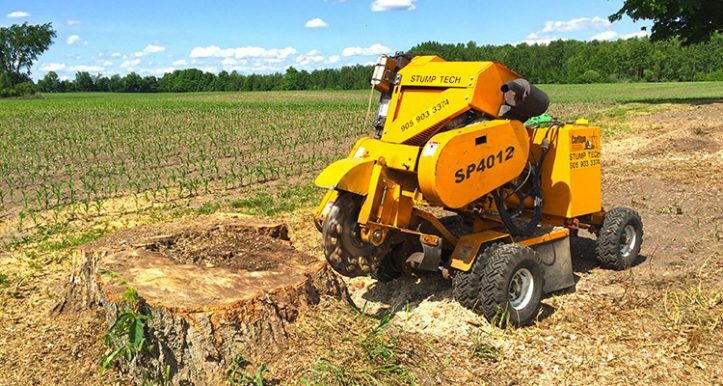 StumpTech staff members have experience removing all kinds of stumps. So even if you have many stumps that need to go they can do the job. Worried that the stump you need removing is too big or too deep? Don’t worry. Our techs have the equipment and experience to get the job done quickly and safely. Our techs also may ask you what you’re going to do with the cleared land. That’s because knowing what the land is going to be used for may affect the price of the job. StumpTech has a minimum charge of $150 (+HST) for work that is done. That price can include more than one stump. So if you have two or three medium sized stumps that could possibly be included in one minimum fee. 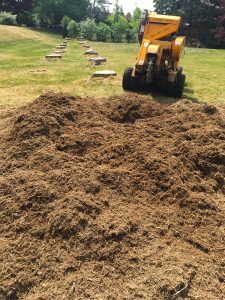 Why Hire A Professional Courtice Stump Removal Company? Hiring a professional stump removal company is a smart way to get those stumps removed safely. Unless you have a lot of experience with home projects and unless you have the proper equipment to remove stumps it can be really dangerous. Removing stumps should always be done by professionals who have experience and have been trained to safely remove stumps. You can get seriously hurt removing stumps without experience and the proper equipment. Hiring a professional company also means that you won’t have to waste a lot of your own time trying to figure out how to remove stumps. You have better things to do with your weekends and time off than battle those stumps in your backyard or on your property. Make an investment in your property and get any stumps removed by professionals. You’ll be able to get the property you want that is safe for your kids and pets with only a minimal cost.